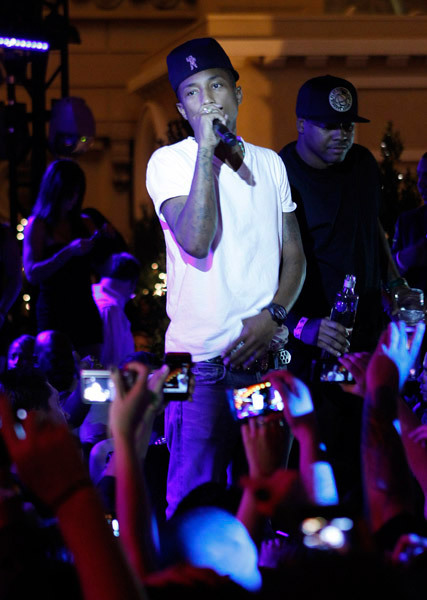 "N.E.R.D "Pharrell Has A Sweet Tooth In Sin City! Gotta love the pun in the header..lol anyway Pharrell was in Las Vegas visiting the Sugar Factory America Brasserie this past Saturday. Pharrell got his sugar rush before heading to the grand opening of Chateau Gardens at Chateau Nightclub at Paris Las Vegas. He also promoted his brand liqueur Qream on the red carpet. Check out photos from the event.